I remember the sketches my friend’s daughter had made of her co-travellers on a train journey. A pot-bellied gent sat slumped in his seat, his eyes closed; a young man sat like the Rodin sculpture; the middle-aged woman next to him was looking out of the window, with an ill-tempered look on her face; on the opposite side sat a young man engrossed in a paperback…. Each to his own. The silence can be sepulchral. She had captured the atmosphere in a train compartment perfectly. Scenes like the above are the norm on train journeys these days. Gone are the bonhomie and pleasant atmosphere that hit you the moment you boarded the train in the not too distant past. It used to be fun — the longer the trip the better it was. A nice book, some friendly co-travellers, yummy packed food, and you were all set! I used to wish that the train would go on and on without a destination with me just enjoying the ride. In fact, I still do! There used to be a category of friends in the line of pen friends whom I called train friends. One easily made friends, talked nineteen to the dozen about everything under the sun and then parted ways when one of us got off. Often we wouldn’t even know each other’s names, yet we would talk about our children, the city we lived in, or the latest movie we had seen as if we had known each other for ages! I can still remember many such friends, their faces etched in my memory but alas, without a name attached to them! Today we talk a lot on journeys too — on our mobile phones. We listen to sounds and sing along — with our earphones jammed into our ears, eat insipid food by ourselves from foil containers before burying our noses in a book to avoid conversations. We can’t blame anyone, given the many cases of drugging and looting we hear of. Who knows whether the nice lady has laced her aloo parathas with something to put me to sleep so that she can relieve me of my belongings? Better be safe than sorry, you say? Not so in the old days. Older women offered child-raising tips and recipes to the younger women, babysat their children for the duration of the trip and so on. Everyone amicably shared the food they had brought along as in a picnic. When a man/ boy/girl was travelling alone, he or she was included in the party and plied with food and warmth. The young ones and even older ones travelling alone today want to be just left alone with their smartphones, a bag of chips and bottles of coke or want to merely sleep through the journey. Back then, no one asked whose berth was whose and everyone looked out for each other. If there were many small children, the ubiquitous hold-all was unrolled on the floor and several young ones slept comfortably. Lower berths were relinquished without a fuss to accommodate the elderly and women with children. Today a senior citizen has to beg, plead and grovel with the young ones to please give up their lower berth often with little success. I have seen it happen many times including to me. These days it is more like the elderly obliging the more elderly! Recently I travelled with a middle-aged couple and it was as if I was back in time! They happily shared my roti and subzi and gave me some of their wonderful pulao. We talked over cups of horrible tasting tea from the pantry car with her delectable homemade crisps. The trip ended all too quickly, alas! And true to the nature of train friendships, we hadn’t exchanged anything more than first names! This couple was visiting their children and carried quite a lot of stuff. One of the bags was bulging on all sides, ready to burst at the seams. Every pocket was crammed with something or the other. It reminded me of the ubiquitous ‘hold-all’ that every long train journey entailed back when I was young. This piece of luggage literally was a ‘hold-all.’ It was slightly smaller than a standard mat and had two pouches at either end, big enough to hold a pillow each. The idea was to use it to store sheets and other clothes well spread out in the middle and then secure the stuff by folding the flaps and buckling them up. This was then rolled tight to make a big bedroll. Sometimes the contents would be too much and prevent the buckles from being fastened. No problem! A rope would be brought and voila! It was all bound up! The hold-all was opened out usually to make a bed for an adult or two kids. Yes, back then there were no cushioned berths except in the first class compartments, so this was a very handy thing to carry. I am sure the older readers of my blog would remember the slatted wooden benches that served as the berths till cushioned berths appeared in the late ‘70s. Truly cattle-class, as Shashi Tharoor would have said. Anyway, I am digressing. Coming back to the hold-all, we kids used to stuff the nooks and crannies with all the contraband that would not pass muster in our mother’s eyes: shells, pebbles, books (many of them), toys and other treasures only children understand the value of. We carried them for our cousins as gifts. As the day of departure neared this item of luggage was packed and repacked with us kids hovering anxiously in the periphery lest something got discovered and thrown out by mother. In hindsight, I think she knew of all the stuff we had stashed away, but pretended not to have seen them! We kids were needed for an important job while packing: the leather/rexine suitcases of those days fastened with buckles and required one or several of us sitting/standing/jumping on them to close them after they were filled to bursting! On the day of the travel, huge tiffin carriers would be packed with puris, idlis, tamarind rice and curd rice, enough to feed almost the entire coach! We would be fed to the gills by our mother in the fond hope that we would not ask for anything to eat the moment we boarded the train. But of course that never happened. The pulling out of the train from the platform synchronized with our grumbling stomach. And mother would grumble some more, but end up feeding us again! The food tasted divine, served on pattals (plates made of dried banyan or sal leaves) that could be simply thrown away after eating. The foil wrapped food we get today might be hot, but not a patch on the food mother served with so much love and a lot of scolding. Water had to be filled at station taps and one waited for the big junctions to do it, as the train stopped longer at those. There were screw-top metal jugs we called ‘kooja’. Some even carried small earthen surahis to keep the water cold in the summer heat. The kids had a whale of a time! There would often be some unaccompanied children escorted by neighbours. I have travelled that way several times too! So the compartments would be full of noisy kids of all ages having a wonderful time, never mind the baking heat and uncomfortable seats. Thinking back, it is a wonder to me how the adults put up with the cacophony and mayhem in the compartment. I can’t but compare this with today’s trains where often there is sepulchral silence with each busy with his or her own thing and not a smile shared. Then there were those rhymes and songs you sang along to the rhythm of the wheels! We kids would sing at the top of our voices. Have you ever noticed how the rhythm changes with the rhyme or the song you are singing? I mean you sing hickory- dickory… and the rhythm would match it, and when you change over to ‘Mera joota hai Japani,’ the wheels would alter their rhythm to the Bollywood song! Ditto for even a bhajan if you are in a mood for one. Next time you travel long distance, try it! I tell you, half the fun of train travel went with the advent of AC coaches. Boxed in and unable to commune with Nature through the airtight and often dirty windows, you can’t hear the robust sounds of the platform, taste the specialty of that region/station. Since vendors other than the railway caterers are not allowed inside AC coaches we hardly get to eat delicacies like spicy chutney smeared cucumber slices, the tangy chana jor garam or the rice murukku, as the case may be, depending upon the region or station you are passing through. I could go on and on, but no amount of nostalgia is going to bring back those magic train journeys. Is it that life has become stressful? Or we have become too self-absorbed and churlish to take note of the world around? I am sure life was not a bed of roses for the earlier generations either, but they had the some of the most important ingredient that made for happy communication – compassion, empathy and generosity. It makes me sad to realise how we are diminished in some way as human beings having lost these vital emotions. Oh yes, turning on the fan with a comb used to be a major source of awe for kids back in my time and our fathers were no less than magicians 🙂 If you like looking at the engine as it turns a bend, you will love the sights of the train running on stilts in the Konkan railway sector. It is a must ride for all train lovers, the scenery, the awesomeness of the technology, everything is to be experienced. Have you travelled on that route? 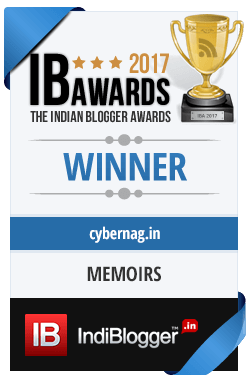 Welcome to Cybernag, Parijatshukla. I am glad you liked the contents here and for the appreciation 🙂 Would be delighted to have you visit regularly. Hmmmm….you took me to my school days! Every sentence is golden here. I have experienced everything, thank god! We used to spread the bedsheet on our laps (even strangers who joined us to play cards) and introduced/learned some new games in the train. Sometimes 11-12 people were playing with 2 decks of cards. Yes, antakshari also was there. Hindi, Tamil and Kannada songs were sung. We never hesitated to open up with strangers. It was safe to ‘talk’ to them. They don’t know us and we don’t know them. That was a big advantage because criticism was less! Chapaathi subzi, tamarind rice and idlies smeared/soaked with oil and chutney powder were always taken with us. Hold all and gooja also were there. I remember buying cassettes and realising how we got cheated after coming home! Everything was taken easy. We were not scared of strangers in those days. I don’t think there were no cheats or thieves in those days too. But people came together when something bad happened. I remember once we went to Bhopal with kids. When the train was crossing Itaarsi, a big group of merchants barged into our reserved compartment and sat on the edges of our seats where we were all sleeping. One man sat on my foot. My husband shouted at him. All of the started shouting back. After they got down at the next station, the co-passengers asked my husband to wait in the toilet until the train left the station. They feared that some goondagardi might be there. The same happened. Some rogues came shouting inside and looked for my husband. I said that he got down to get water and they all got down. Thank god, the train started. This happened everyday, it seems. I still remember this incident. My children were small and they were scared. But I love train journeys…yes, the a/c compartments have reduced the fun, though! Enjoyed reading your post, Zephyr! More than antakshari, it used to be lound singing and clapping, driving the elders crazy 🙂 I forgot to mention the cloth hammocks (thooli) that was hung from the wooden slats of the upper berths to put a baby to sleep! Wasn’t it amazing how the children mixed with everyone and made friends so easily? Even my children had had the privilege of traveling in such friendly compartments. The silence and aloofness have only started in this millennium, probably coinciding with the rise of smartphones and social media, don’t you agree? The incident in Itarsi sounds scary. It was great the way you managed to handle it without giving yourself away. As for AC compartments, they have become necessary for health reasons, but when the weather is good, as during the rains of till November, I prefer traveling by non-ac if I am not carrying much luggage. Safety has also become an issue if you are travelling alone. Train journeys were so much fun! I waited for our yearly summer trip to Delhi where my maternal grandparents and mama stayed and while the thought of meeting them was exciting, what was the cherry on the cake was the train journey! Like your friend’s daughter, I would observe co-passengers and fish out a notebook and pencil to draw them out. The open breeze, village landscapes, tunnels, fields, kids waving at us, it was all mesmerising. Then there was the food ma had packed lovingly and shared with everyone, as you reminded. 🙂 I can’t think of a more pleasurable picnic than these train ones. I am happy your son is learning to sing alone with the train’s rhythm. Btw, love your Little Red Box! When I was around seven, I met this north Indian girl of my age in the train. Our families had bonded as fellow passengers and made the both of us sit together. I knew very little hindi and she knew nothing in malayalam ( my tongue). But we managed to converse through broken hindi and gestures. I must say that it was one of the most fun train journeys I had, and I remember playing small games with her too. True as it is, the camaradarie is no longer seen in most of today’s train journeys. While reading this post I felt as thoug I am reading my own traveling experience. Our journey use to be very long, from nanjangud ( small town in Karnataka ) to Gwalior, it use to take almost three days, but we use to enjoy. Mummy use to make many snacks like mathri,bhel, laddus and puris. It use to be fun, really we miss all that. What exquisite timing 🙂 It is just the day before that I had a guest who,originally, was a train friend 🙂 Met him on the train from Bangalore to Delhi in 1990 or so and we are still in touch, visiting each other and all – and that, despite, my being about a decade plus older than him. Ah, that must have been so satisfying! Alas, all my train friends remain nameless, except for one boy who travelled with me from Madurai some years back. He sends me greetings on festivals and sometimes just a hello. Nothing more, though he had shared his life story with me during the journey! Reading your post, I got nostalgic about my train trips as a kid. The smell of pooris, alu subzi and mango pickle is still afresh in my mind! These days, all u see people do is fiddle with their mobiles. I remember how my parents used to buy me comics before every long train journey! Such a lovely post which I had obviously missed as I was not a blogger then. Never too late…. That is why I am updating some old posts and publishing them again, Rahul! Glad you liked it. That’s a pretty detailed account of the train journeys of yore. The general air of camaraderie that you describe made the long, taxing journeys enjoyable. These days people have their smartphones or laptops and generally do not even bother to exchange pleasantries. But we don’t have to sweat it I guess. You are so right. We don’t need to sweat it out 🙂 I began the post and one memory after the other kept tumbling out and I began recording them all. And like the time I found the couple in my compartment, I do sometimes get lucky with co-passengers making the journey so pleasant, almost like the olden days. Thanks for reading and commenting, PKayen. Lovely 🙂 I do love a good story about trains! I know it’s often a “yesteryear” kind of memory, as you say, but actually sometimes it’s not….it’s very possible, always available, and sometimes we’re lucky enough to find it, no? Train journey gives an opportunity to meet people of different regions, culture and languages. We come to know of their food by sharing (whole compartment fills up with the smell the moment food packets are opened)but now an element of suspicion is creeping in! Ofter we read about people offering some food or drink and later vanishing with valuables.What a coincidence that you too have enjoyed the songs sung along the rhythm of the wheels. Yes, I not only enjoyed the songs of the tracks, but also taught my boys the rhythm and fun of singing alone and discovering new rhythms! Those were the days, weren’t they? used to love travelling in trains as a kid but as I grew up, my tastes changed and I started appreciating the AC coaches more than anything else, though during my undergrads, we would always travel by 3 tier sleepers – allowed more of us to get together on the train and basically create a racket. what I remember from childhood travels most are the jhal-muri wallahs (spicy rice puff vendors) who would go about the train with a weird contraption of a storage device. i still find it interesting. the thing about ac coaches as you mentioned is a lack of commune with the nature, there would be no rush to down the shutters as the rain starts splattering against the windows. it was fun, but given the sort of long journeys and the heat, i found it a blessing that the option of ac coaches was there to be taken. I wouldn’t dream of travelling across the length/breadth of India in a regular sleeper – I would be to unsociable a person by the end of that journey. lack of time, low air fares has meant that fewer of the affluent professionals (esp the young ones) travel by train unless they wish to, and take to the skies instead – between 09/2005 and 10/2008 I travelled by train thrice and took to the skies every 2 months. Welcome back Sumit. Missed you here! You said it. The Jhal muri wallahs, the samosa patti wallahs, the guava vendors — they all are missing in AC coaches. But as you say, it is impossible to even think of travelling by sleeper coaches today, especially the overworked and sleep deprived younger generation, who want to either sleep off the journey or shorten it and reach their destination. It is gratifying to know that you made a life-long friend on a train journey! sorry about that. been quite busy with various things – moving house, work deadlines, a friend bidding ‘adieu’ to everyone – the works!! not very sociable on any front to be honest! I loooooooooooove puliyotharai! :) With lots of chips, appalams and vadams…slurp! You are right about travelling in general compartments, though its been a long time since I travelled in unreserved coaches. the middle berth is the best because you can lie on your stomach and watch the world go by. in the upper berth, all you can do are read and sleep, like the Rat! No i won’t kill you if we happen to travel by the same compartment. I love train journeys, specially the AC ones. 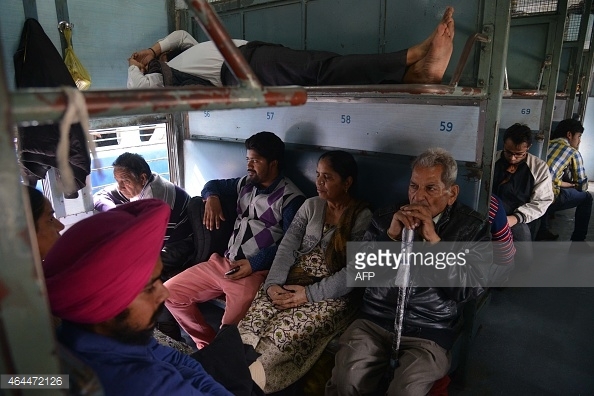 Nevertheless I have travelled by sleeper class on many occasions. One particular experience I want to share with you. Four yrs. back I travelled Pune- Delhi with my young daughter. Ironically, our seats were in two different bogies. Just a mention about this & a young boy exchanged his lower berth ( which we promptly gave to an old lady) with our middle berth in another bogie, so that both of us could travel together. The real picnic started after that. No one shared food for security reasons. We travelled playing cards, antakshari & talking on varied topics & taking care of each other’s belongings. It will surprise you to know that an old Marwari couple, a father-son duo, me n my daughter comprised that odd group. The old lady insisted on applying mehandi on my daughter’s palms. Somehow we managed to explain to her that she was going for admission to a professinal college & therefore it was not possible. We all got down at Delhi & went our own ways without knowing each other’s names. I wonder if any other co-passenger could make out that we were strangers before we met & are strangers today also. I can relate to your particular experience on the train. Our railways is a microcosm of life, aren’t they? Please keep visiting and writing. 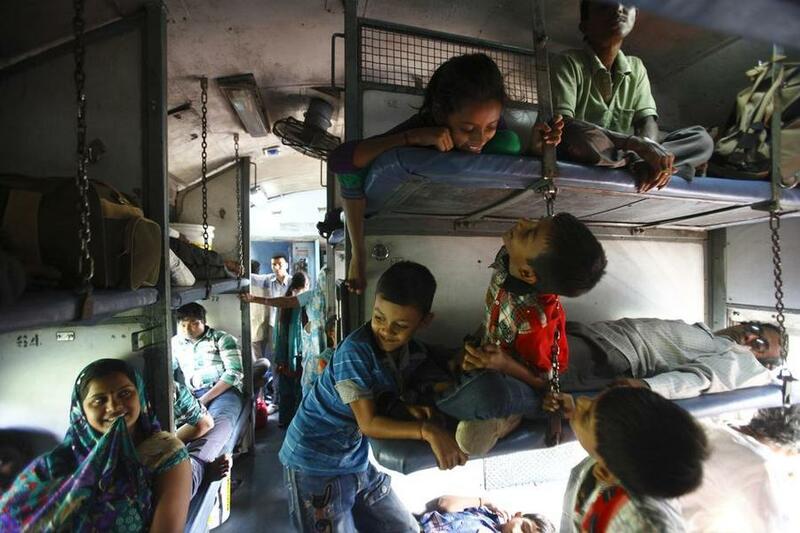 Train journeys was an integral part of our growing up ! We were so blessed to have a travel buff for our Dad ! Thanks to his love for travel, not to mention his transferable job, we did manage to cover the length and breadth of the country ! Our summer vacations were planned meticulously, be it on LTC, when we traveled by FC(first class – sort of community travel but with little more privacy !) or sleeper coach at other times. He’d draw out a detailed plan, allowing for as many stops as possible, for us to see as many places, booking circular(where one could go one way and return another way..) tickets. My mother would spend days before departure making all kinds of savouries and of course the big steel tiffin carriers that you mention, was packed on the day of travel, with food that wouldn’t last for long….puri/sabji/lemon rice/curd rice and the likes….We so looked forward to these trips…..the journey used to be long, sometimes as many as 4 days at a stretch, yet I don’t remember ever getting bored…..There was no end of things to do on the train….read, play cards/anakshari/word game, interact with co-passengers, eat incessantly or just watch the landscape pass by……Those were the days !! I still love train travel, but it certainly has lost its earlier charm ! Hey Chits, the stories all sound so alike don’t they? But the thing is there were many kids and the families were large! Today’s kids are poorer by comparison being single or one of two, and unless they have fun-loving and imaginative parents they can’t have so much fun anymore, right? I agree with you about the AC coaches. People say they are more comfortable and assumingly carry ‘sophesticated’ ones, but I like the sleeper class more. The sharing of tiffins, the flicking on the fan atop with a comb to get it started, the fighting over seats and many many such things make the journey interesting.The activity and the mayhem is integral to it, but that’s where the fun part of the travelling lies. Oh yes! I forgot about the combs used to start recalcitrant fans! 🙂 I am happy to see a kindred soul who also loves the sleeper coaches. Kids love moving around the coaches which not only keeps them happy but us free to read a book, right? But the world being what it is today, we do have to keep an eye peeled so that they are safe! 🙂 this made me smile. I love train journeys and have very fond memories of my yearly travels from Delhi to Pune. I did a post on romancing the trains , maybe it is on my blog or the other site I write for. will check it up. You lnow when you talk of tiffins it reminds me of the gujju families that used to travel with us. what a varity of food they carry. simply unbelievable . It was nostalgic to read your post. I would love to read your post on trains. Do dig it up! It is not only the oler generation that misses the family trips by trains but also the younger one, as is evident from Siddharth’s comment. you seem to be travelling a lot in the trains these days anyway! How was it in the locals in Mumbai? Yes, but I miss the fun of those days. Mumbai local trains were ‘wonderful’ too. You have to learn to appreciate and then enjoy them. Once you get the hang of these two feelings, you don’t notice the discomfort or inconvenience. How are you finding it? I would beg to differ here… travelling once in a while in a Mumbai local in off-peak direction or time is very different from having to travel daily in peak traffic. Almost makes you wonder why you ironed that shirt or even took a bath early morning in the first place! I was talking of the commuting during peak hours. You see, I had been a daily commuter too at one time! Reminds me of those wonderful journeys I had as a kid. My dad loves to see different places so he made it a point to plan an annual trip…. all 6 of us (grandparents, parent, sister and I) would go on the trip… this usually ment the whole set of 6 seats to ourselves… very convenient for all of us… my sister and i even drew lots as to who would sleep on which middle berth, which parent would be on the berth above us and which grandparent on the berth underneath… even though the trip was for only two weeks we would enjoy it thoroughly… no homework, see new places and travel… what more does one need? Even today, my dad does plan and go on the annual trips but only my mum accompanies him… grandparents dropped out when they got too old to travel and then we kids moved to hostel and had different schedules of holidays and stuff. My dad sometimes says that he doesn’t plan with as much enthusiasm cos he doesn’t enjoy it anymore… not in those many words of course, he’s a man of few words. I think he misses the family affair. In fact, the first year he and maa went alone they went to Panchgani (from Pune) and came back after the trip thoroughly bored… I still remember my mum saying how thoroughly bored both of them got… It was like they went for a honeymoon after 23 years 😉 but the magic was missing…..
How right you are about your folks not having the same fun as they did with all of you. The excitement is missing and even when you do enjoy something about your trip, you keep reminding each other how one or the other of the kids would have liked it or what they would have done. And yes, it can get a bit boring at times too.